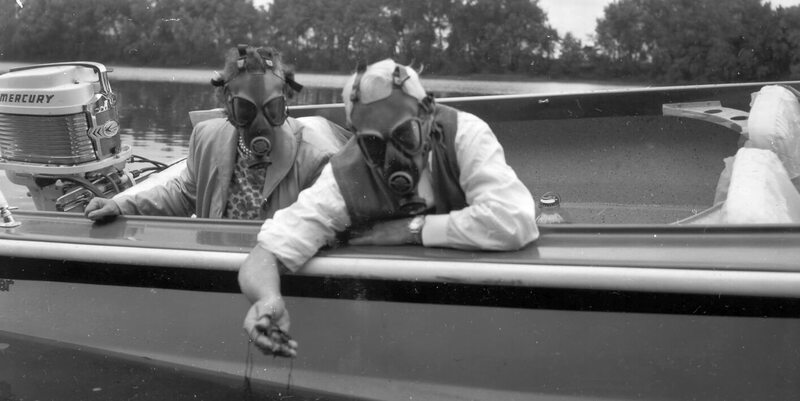 Connecticut River Watershed Council President Dr. Joseph G. Davidson and his wife Madeleine embarked on a seven-day trip by canoe, powerboat and car in the fall of 1959. 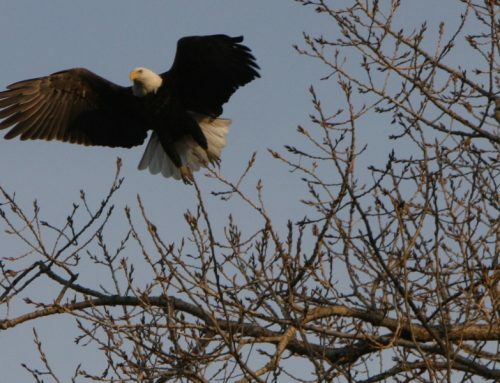 The purpose for the trip was to call attention to the need for better conservation practices on the Connecticut River, particularly around pollution control. Deeming his trip a “publicity stunt” the press took up the call and delivered with news stories reaching audiences throughout the Pioneer Valley but also extending to all the major New England cities. Radio and AP/UPI bulletins kept nearly hourly reports. The Davidson’s began their journey on September 26, 1959 with renowned New Hampshire guide Harry Scott and Elmer R. “Bud” Foster (then CRWC Executive Director). 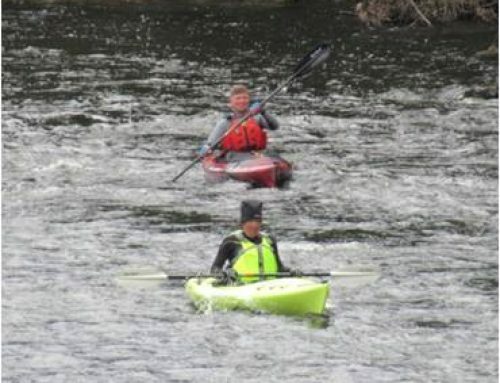 After crossing the Second Connecticut Lake by powerboat, they transferred to canoe and paddled Third Connecticut Lake. From there they hiked the stretch to spring-fed Fourth Connecticut Lake, the source of the Connecticut River. It was here that the Davidson’s drank freely from the fresh water, “the last we’ll be able to take from the Connecticut,” he reported. 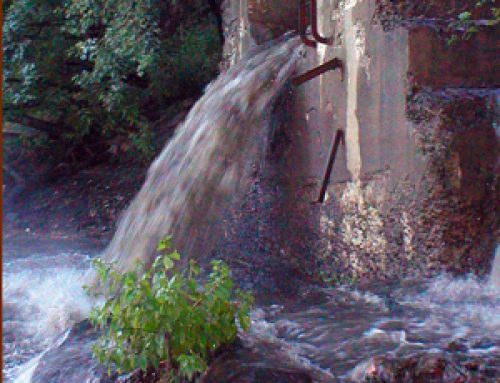 Several iconic photographs depict Davidson shepherding two jars of water along the route—an explicit comparison of the range of the water quality on the river from the clear waters of the north to their polluted counterparts farther downstream. They were greeted at each stop by many area dignitaries (such as Charles Wittier, President of the White Mountain Boat Club, Vermont Governor Strafford, the Dartmouth College Geography Club and the Dartmouth-Lake Sunapee Association) who helped shuttle them from place to place, arrange public receptions, and discuss the issues on the river—from motor boating as an important recreational activity, to the strong odors they encountered in northern Vermont from raw sewage dumping (at that time approximately 30 communities in Vermont had started construction of or were in studies to build sewage treatment plants), to the importance of industrial development of the river. During a torrential rainstorm on the third day of their journey, a submerged stone crushed the front of their boat in the rapids between Hartland and Plainfield, NH. This was a coincidental accident, of the same kind that momentarily derailed Major Rogers of the Rogers Rangers in 1765 (and you can read a short account of this historic event in the November 1959 CRWC Newsletter). Highlights of their trip included: making a presentation to 350 high school students in Charlestown, NH; a welcome parade in Bellows Falls, VT; a steamboat ride to Brattleboro, VT; their delight in viewing the French King Bridge—the highest bridge in New England and gateway to the Mohawk Trail in MA; and numerous dinners and receptions with prominent citizens of various towns. Farther south they were taken from Hadley to Holyoke, MA to see the new Mt. 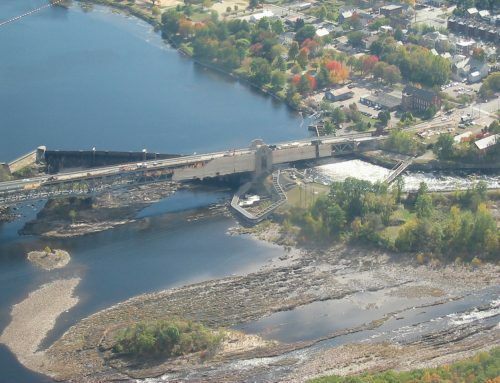 Tom Steam Plant and inspected the Holyoke Fish Lift (which had assisted 15,000 shad upriver the previous spring). In more recent years the Fish Lift has served 391,096 (July 2016), 413,239 (June 2015), 374,232 (July 2014). They were taken by boat with many state officials, including Lt. Governor Dempsey and members of the press. In So. Windsor, CT they viewed two miles of extreme soil erosion on the riverbank. “One area has eaten away 300 yards of valuable agricultural land in past 30 years” (Notes on River, p. 4). One account, described by George Bragdon of the Hartford Times: “Suddenly the vast expanse of Long Island Sound opened before Dr. Joseph G. Davidson and his wife, Madeleine who for seven days had traveled down the 410-mile Ct River. Throwing his arms around Mrs. Davidson, he exclaimed: ‘We made it. From the source to the sea.’” In the end, Dr. Davidson offered Lt. Governor Dempsey a choice of the two water jugs he had carried throughout the journey—the clear one from the Fourth Lake and the unsightly one sampled near Mt. Tom, MA. The former was chosen and was on view in the Governor’s office as a reminder of the care and protection the river requires. 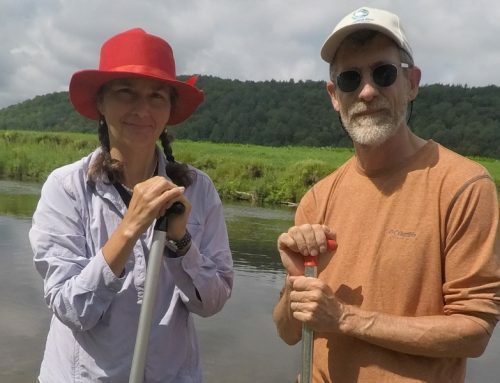 The Davidson’s journey not only called attention to the need for understanding the river’s problems and the critical need for cleaning up and protecting its great resources, but also helped the public learn about the important work of the Connecticut River Watershed Council. Itinerary of Proposed Canoe and Boat Trip on Connecticut River by Dr. and Mrs. Davidson—September 25-October 3, 1959, prepared by the Connecticut River Watershed Council.